talkingeconomics - FTA with Malaysia: Will it Lead to an Expansion in Flow of Trade and Investment with Sri Lanka? FTA with Malaysia: Will it Lead to an Expansion in Flow of Trade and Investment with Sri Lanka? 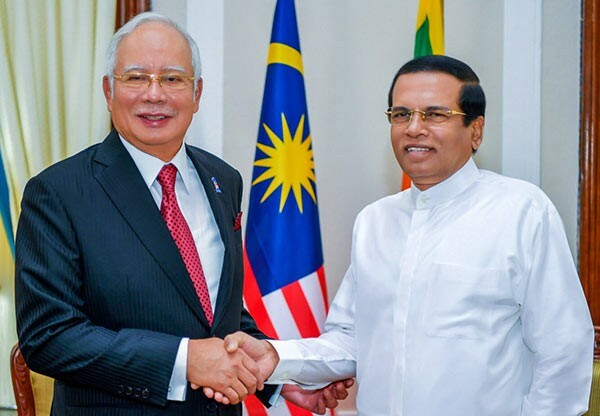 Prime Minister of Malaysia, Najib Razak, who was on an official visit to Sri Lanka in December 2017 to mark the 60th anniversary of diplomatic relations between the two countries, has agreed with his counterparts, to expand cooperation in fields such as trade and investment. He said a Free Trade Agreement (FTA) would be useful to expand bilateral trade and steps would be taken to explore its feasibility during his meetings with President Maithripala Sirisena and Prime Minister Ranil Wickremesinghe. Compared to its neighbors in Southeast Asia, Malaysia was a latecomer to FTAs. But now it does not want to be left out of major deals. Malaysia has signed 13 FTAs with ASEAN and other partner countries: 7 bilateral FTAs and 6 regional FTAs. Malaysia signed its first bilateral FTA with Japan in 2005. Since then, it has signed deals with South Korea, Pakistan, Chile, India, New Zealand, Australia, and more recently with Turkey. It is in negotiations with Hong Kong, the European Union (EU), and the European Free Trade Association (EFTA), while also being involved in the Regional Comprehensive Economic Partnership (RCEP) and the Trans Pacific Partnership (TPP). Malaysia has been in FTA talks with the USA, but these have been shelved since 2009 over a number of issues (government procurement, Bumiputra policy, etc). Malaysia’s approach in negotiating FTAs has been progressive; while its initial FTAs reduced tariffs and non-tariff barriers, those signed recently have been more comprehensive, with deeper commitments, indicating that Malaysia has stepped up its game. A FTA with Malaysia opens avenues for Sri Lanka to enter into the dynamic Malaysian market and plug into value chains in the region. Sri Lankan exporters, importers, and consumers can stand to gain by opening its market and freeing trade and investment between the two countries. Trade between Sri Lanka and Malaysia has grown moderately over the past decade. Aggregate bilateral trade (exports plus imports) increased from US$ 384 million in 2007 to US$ 684 million by 2016, representing a 75% rise. However, such figures belie the actual state of affairs. An examination of disaggregated statistics indicates fluctuations in bilateral trade. Furthermore, trade flows have been persistently asymmetric; Sri Lanka has been running a trade deficit with Malaysia, given that exports have remained somewhat stagnant, while imports display an upward trend. In 2016, the trade deficit stood at approximately US$ 599 million, almost double the figure recorded in 2007. However, one should not be too concerned about the growing trade deficit, given that over 60% of total imports (excluding consumer goods) from Malaysia consist of intermediate goods, capital goods, and raw materials, which are in turn used as inputs into production and exports from Sri Lanka. As a trading partner, Malaysia is the 6th largest source of imports to Sri Lanka; Sri Lanka imported goods worth US$ 642 million from Malaysia in 2016, accounting for 3.3% of inflows into the country. 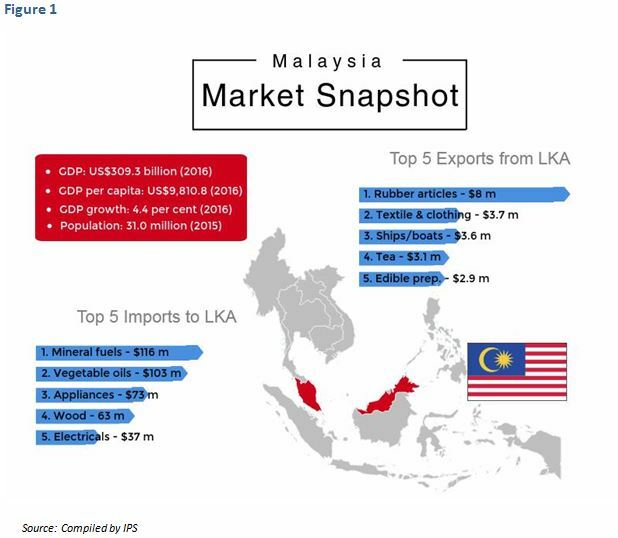 Conversely, Malaysia ranked at the 36th place in terms of Sri Lanka’s export markets, with Sri Lanka exporting US$ 42 million or 0.4% of total exports to Malaysia. Main exports from Sri Lanka are, vegetable products, rubber articles, textiles and clothing, food products, while imports from Malaysia included fuel, vegetables, machinery and electronics, and wood products (Figure 1). To truly maximize the benefits of the bilateral trade relationship, Sri Lanka needs to significantly increase the quantity and the value of exports to Malaysia. Opportunities for this still exist in a selected number of export products, given the supply and demand situation between the two countries; for example, rubber, tea, etc. International trade statistics indicate the market potential for “Black Fermented Tea” to be around US$ 27 million in Malaysia. However, Sri Lankan producers face stiff competition when catering to the Malaysian market. Such competition is intra-regional in nature, with nations like China, Vietnam, and Cambodia offering relatively similar products at a significantly lower cost. Furthermore, Sri Lankan exports lose competitiveness when slapped with high import tariffs. For instance, Sri Lankan exporters struggle to compete with regional traders who have duty free access given their countries’ membership in ASEAN. If Sri Lanka liberalizes trade with Malaysia under a FTA, exports are likely to increase by US$ 2.34 million, according to preliminary estimates by IPS. This would amount to a 6% increment from the current export levels. Significant gains can accrue to rubber products and tea, which together encompass more than 60% of potential trade gains under a FTA. Particularly, Sri Lanka is projected to make strides in the export of pneumatic tyres, solid/cushion tyres, and black tea, if Malaysian tariffs on such produce are eliminated under a trade deal; currently Malaysia imposes custom duties of 23%, 25%, and 5%, respectively on these items. It is important to note that these projections do not take into account the effect of liberalization on the rest economy. However, it is worrying to note that commonly used trade indicators do not suggest a huge potential for bilateral trade expansion. Growth in exports has been negative during the past five years. Trade Intensity Index has been falling over the last ten years, suggesting that Sri Lanka has been trading less intensively with the Malaysia vis-a-vis the world, while Trade Complementarity Indicator also remains low. The latter suggests that Sri Lanka’s export/import structures do not align well with those of Malaysia. This premise is further supported by a cursory look at the Revealed Comparative Advantage indicators of Sri Lanka and Malaysia, which show both countries are competitors in some exports, reducing the potential for bilateral trade expansion. Given the importance of the services sector in both countries, accounting for more than a half of economic activity and expansion of export and import of services, there might be greater benefits from liberalization in trade in services; opportunities are already increasing due to Malaysia’s liberalization policies since 2009. In addition to being a popular destination for Foreign Direct Investment (FDI), Malaysia has successfully become a significant outward investor as well. Malaysian firms are increasingly investing in Asia and in the services sector. Outward investment by Malaysian firms has steadily increased and has consistently topped more than US$ 7 billion a year since 2009. Malaysia is one of the main sources of FDI into Sri Lanka, accounting for 14% of total FDI inflows between 2005 and 2015 (at US$ 1.36 billion). These investments are mainly in the telecommunications, construction, and education-related services. 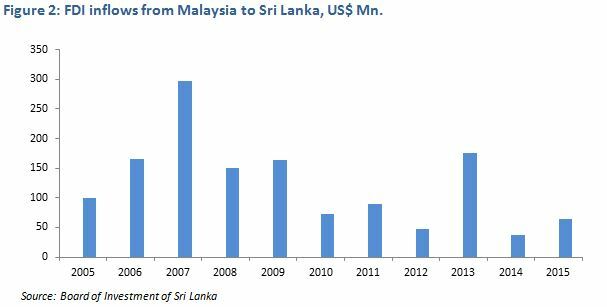 Malaysian investments have gradually declined over the past few years, but this is in keeping with the general trend of FDI flows into Sri Lanka (Figure 1). The largest Malaysian investor in Sri Lanka is Dialog Axiata, a cellular mobile telephone network provider with a reported investment close to US$ 2 billion. In addition, Maxis Berhad has also invested in the telecommunications sector through Sri Lanka Telecom. Recently Khazanah Nasional Bhd bought an 8.9% stake in Sri Lanka’s largest listed company, John Keells Holdings PLC for US$ 120 million. Major investments have also taken place in the educational sector (e.g. APIIT), agriculture (e.g. Naratha Agro Industries), and construction (e.g. Wincon Development Ceylon Ltd). It has been reported that Malaysian businesses are also interested in investing in other areas such as health, the energy sector and agriculture. A FTA with Malaysia can further facilitate cross-border investments by easing the entry for Malaysian investors in the context of an improved business environment in Sri Lanka. A FTA will make it easier for Sri Lankan goods to gain a foothold in the Malaysian market by lowering tariffs that Malaysia imposes on imports from Sri Lanka. This will help make Sri Lankan businesses more competitive in Malaysia. A FTA will also lower the cost of Malaysian products for Sri Lankan consumers and businesses. A comprehensive FTA will give service providers better access to both markets and reduce a number of other barriers to trade in services and investment flows. In this context, Sri Lanka and Malaysia have decided to undertake a joint feasibility study to explore the potential for FTA. Preliminary estimates suggest that likely gains from bilateral trade liberalization in goods will be limited to few products but there might be gains from other areas of cooperation, namely in investment flows to Sri Lanka. Moreover, a FTA with Malaysia in addition to a FTA with Singapore, which is under negotiation, will help to step up Sri Lanka’s relationship with ASEAN and to explore opportunities for greater economic engagement with South-east Asia. *This blog is based on a report on the ‘Benefits and Costs of a Bilateral Trading Arrangement between Sri Lanka and Malaysia’, by Kithmina Hewage, Vishvanathan Subramaniam, and Janaka Wijayasiri.